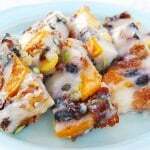 Songpyeon is a must-have Chuseok (Korean thanksgiving holiday) delicacy. 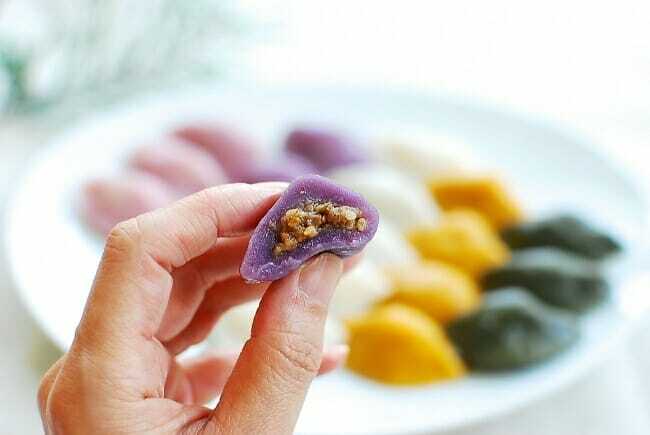 These little rice cakes are stuffed with sweet fillings. 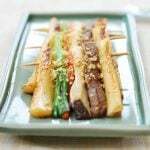 Learn how to make songpyeon with natural food coloring options! Tomorrow is Chuseok (추석) in Korea – one of the two most celebrated traditional holidays together with the lunar New Year Day (Seollal/설날). Also referred to as Hangawi (한가위), it falls on the 15th day of the 8th lunar month – the same day many Asian countries celebrate a Mid-Autumn Festival. Families gather and celebrate the year’s harvest, giving thanks to their ancestors. Women of the house work hard for days leading up to this day to prepare a sumptuous holiday feast. 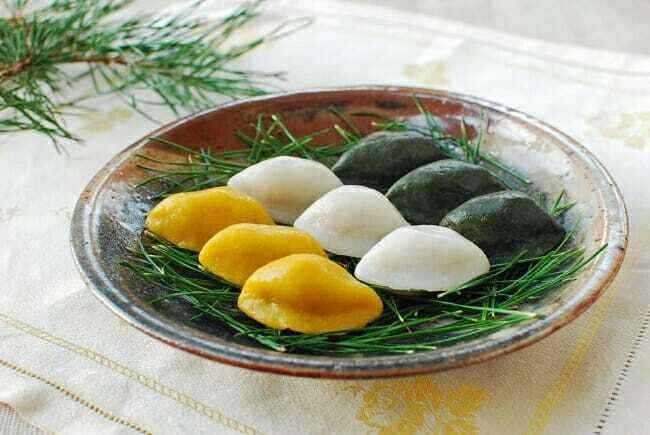 A must-have Chuseok delicacy is songpyeon (송편) – small half-moon shaped rice cakes (tteok). 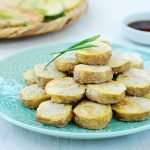 They are stuffed with sweet fillings, such as sesame seeds and mung beans, and steamed on a bed of pine needles. The name songpyeon stems from the use of pine needles (“song” in “songpyeon” means pine tree). 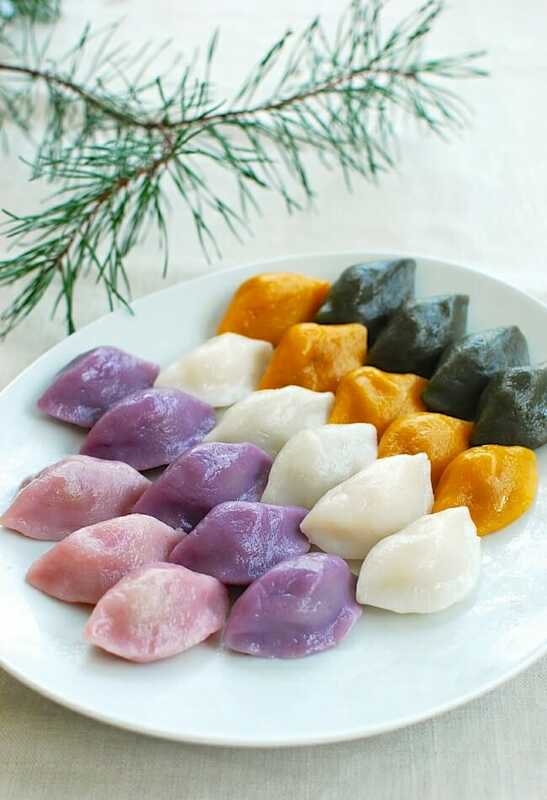 These little rice cakes are near and dear to my heart, bringing back so many fond memories of this special holiday. A couple of days in advance, we would go to the nearby woods to pick pine needles. Making songpyeon was so much fun. I remember the excitement I had sitting in front of several colorful huge heaps of dough – as if I was like a child sitting in front of big piles of play dough. But, shaping and stuffing these little guys was also a serious business. There was always a little unannounced competition among us – whose songpyeon looked the best. My mother used to say I would have a pretty daughter because my songpyeon was pretty. She was right! I developed this recipe, so you can start making these at home, creating a new family tradition and build special memories. Songpyeon is made with short grain rice powder (쌀가루), NOT glutenous (sweet rice) powder (찹쌀가루). Traditionally, short grain rice is soaked overnight and drained before being ground into fine powder in a gristmill. While that’s clearly not an option here in America, there are bags of frozen wet rice powder that’s made specifically for making rice cake sold in the freezer section in Korean grocery stores. The rice powder is mixed with boiling hot water and kneaded into soft dough. The longer you knead, the chewier the texture of the rice cake will be. 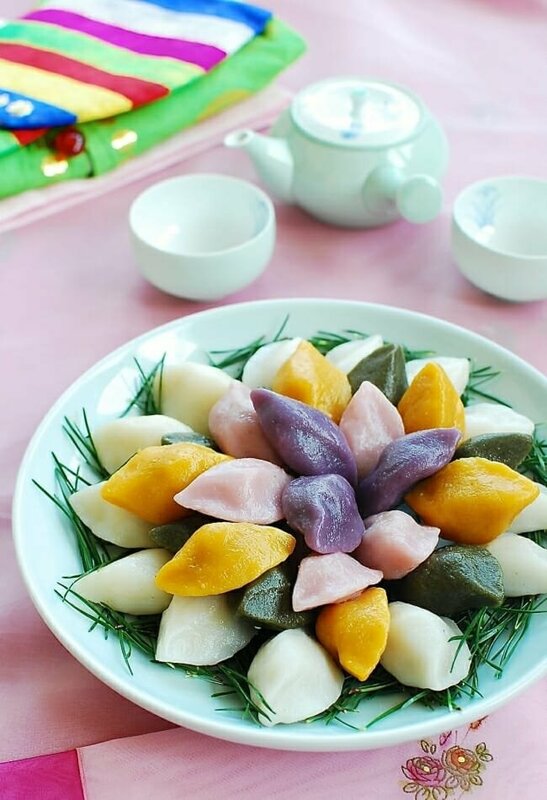 Songpyeon dough is typically flavored and colored with natural ingredients such as mugwort, kabocha, and dried fruit powders. I played around with different natural food coloring and had so much fun with it. You can choose any number of options I’ve given here, or use your own food coloring options. 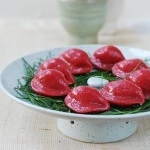 You may also like this beautiful red beet songpyeon. Happy Chuseok to all of you and your family! Roughly grind the sesame seeds in a grinder or blender. Add the sugar, honey and pinch of salt. Mix everything together well. For each type of dough, sift the rice powder into a bowl. Prepare the flavoring and liquid ingredients (water/juice/kabocha) for each selected color of dough. Add the specified amount of the solid and/or liquid (making sure it’s boiling hot) to the rice powder, quickly stirring them in with a spoon. Cover the dough with plastic wrap or a damp towel. Let it rest for 20 to 30 minutes. To assemble, tear off a small piece of the dough enough to make roughly 1-inch ball. Roll tightly between your palms to shape a ball. Make a well in the ball by pressing into it with your thumb, and press outwards, with both of your thumbs, on the inside walls of the well to slightly expand the opening. Place 1/2 teaspoon of the filling in the well. Seal tightly by squeezing the edges together. Squeeze the whole rice cake lightly in your palm to firm it up. Shape it to resemble a half moon. Repeat until all the dough/filling is used. Boil water in a steamer. Place a thin layer of pine needles or a damp kitchen cloth on the steamer insert. Boil the water over high heat. When it starts to steam, place the rice cakes on the steamer insert without the pieces touching one another. Cover with a thin layer of pine needles, if available. Cover and steam for about 20 minutes. These are really beautiful sweet treats, Hyosun. Even if I tried very hard I would never obtain such neat, equally shaped rice cakes. Not to mention their consistency which I’m sure is perfect. Happy Chuseok! Hi Sissi! It will come with practice. You can do it! Thanks for visiting. Happy Chuseok to you too. I bought some Songpyun at the orean grocery store yesterday. I should have make some but didn’t have time. Your songdyoun looks gorgeous, Hyosun. Happy “Chuseok” to you and your family. Enjoy the full moon and make a great wish! Thanks, Holly! Hope you and your family had a great Chuseok. 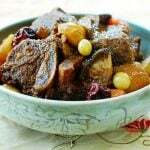 What beautiful photos, and thank you for sharing this recipe and helpful photos! I love your natural food coloring! I wish I had all the ingredients and equipment on hand to try this out–well, if I ever do have the opportunity to make this, I now know where to find a good recipe! 추석 잘 보내세요! Thank you, Erica! Great to see you. Oh wow, this is something I’ve been planning to make long time ago and you’ve all the details here. Thanks so much for sharing it. Happy Mid Autumn Festival to you too! Thank you, Christie. Hope you get to make it soon. It’s really not that hard to make. Hope you and your family are enjoying Mid Autumn Festival. This is so pretty!!! I love Asian sweets as it’s not so sweet and it’s always subtle beauty. Happy Mid Autumn Festival to you!! Thank you, Nami! Happy Mid Autumn Festival to you and your family as well. Looks so pretty, first time seeing something like this. 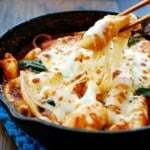 This is easiest Songpyeon recipe EVER! Thank you so much for sharing! Next Chuseok, I will surprise my mother-in-law with some well made songpyeon! Thank you, Anonymous! I know your mother-in-law will be so proud of you if you make these. Both my mother and mother-in-law were very impressed with these. 효선 씨, thank you for the recipe. 추석 잘 보내세요. Sorry for the late wishes. Thank you, Ester! Hope you had a wonderful 추석 feast! Your blog is very unique and articulated lorry especially pictures. I really enjoyed your articles too. Ms. Ro. What a wonderful blog! I had a question about the shelf life of these rice cakes. I was given a box after celebrating a boy’s dol and they were so delicious but went stale and dry after one day. Is there anything I can do to make them edible again? Next time how should they be stored to make them last longer? Thank you, Rosa! Rices cakes are best to be eaten within a day. If they are hard next day, you can steam or microwave them. They will get soft again. Keep them in the fridge if you’re going to eat in a few days. Otherwise, freeze them. You can steam or microwave to reheat. Cover with a soaked wet paper towel or napkin if using a microwave. It will prevent the rice cakes from drying out. Hope this helps. Thank you so much for your response – that was very helpful! do they sell this in korea any day other than chuseok? Not as plentiful, but they usually do. Hope you find them. I would like to try making this too! But is it okay to not include pine needles at all? Certainly! It’s optional. I am glad to hear you’re going to try it. Good luck and enjoy. oh so nice and delicious i want to make right now.. Does the filling come out liquidy when it’s done? I tried a rice cake with filling that seemed to have sesame oil and something sweet…maybe honey, but it wasn’t as thick as honey? It’s sugar usually mixed with ground sesame seeds. A little bit of honey can be added too. I would like to purchase some purple rice powder by the bulk for cooking and eating can you give me some ideas in where I can buy this product. You’re such a nice wife! I really hope everything turns out great for you and your husband. I have no doubt you will do well. 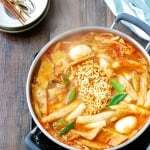 Looking at this recipe to get ready for tomorrow’s Chuseok and feeling inspired. I love all your creative ideas to get natural food colorings in the rice dough. Thank you so much, always!! Hi! I’m making these for a school project and I have a few questions. First of all, How long would you recommend storing these? And will they stick together when you store them? It would be great if you could respond ASAP. Thank you so much! Sorry I didn’t respond sooner. I was busy with the family over the holidays. You can first freeze on a tray/dish without pieces touching, and then keep them in a freezer bag. This way, they won’t stick together. Songpyeon can keep well for a few months in the freezer. These look delicious . Where can you find pine needles? Can you take them off your trees and just rinse them first?